British comic actor Rowan Atkinson’s two most famous projects have always seemed at odds with each other: Blackadder was that rare, weird thing, the historical period sitcom, catering to the actor’s talent for highbrow references and the relish with which he can attack a nice, protracted bit of wordplay. 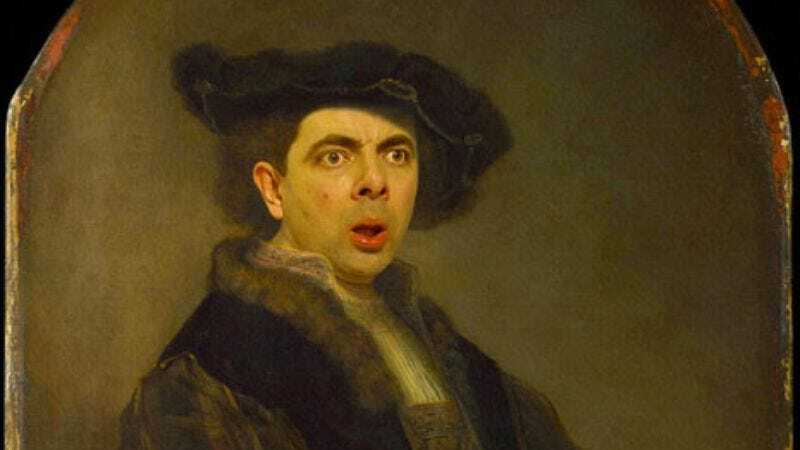 On the other hand, the title character of Mr. Bean is nearly mute, relying solely on Atkinson’s penchant for physical comedy and his distinctive, rubbery, expressive face to sell the humor of whatever digusting, bizarre, or ridiculous situation the hapless hero has stumbled into now. These wouldn’t be half as funny if they were exaggerations or caricatures like some of the other work in Pike’s portfolio, but they’re actually quite good approximations of Atkinson’s amazing face, which only makes them all the more giggle-inducing against the staid backdrops. You can see more of the Atkinson portraits, as well as all of the names of the paintings altered, here, and more of Pike’s work at his online portfolio.